Resistance spot welding is a process where heat from electrical resistance is used with force and time to weld metallic materials. The concentration of pressure and electricity in a small “spot” causes the two sheets of metal directly between the caps (seen above) to melt into a molten state. Once cooled, these sheets have been “spot” welded together. Resistance welding’s primary use is in the manufacture of automobiles, where the average car has some 5,000 spot welds. The rise of coated steels, high strength steels, and most recently hot stamped steels and aluminum in the automotive industry have presented challenges to this simple but effective joining method. RWMA Class 5: ALUMINUM-COPPER is recommended as a high-strength backing for other resistance material, in flash welding dies, secondary-circuit welder arms, knees, platens, etc. It can be used to advantage in structural, current-carrying members in welding fixtures where high strength, wear resistance, and non-magnetic properties are required. and galvanized steels. It allows a stable start-up and generally outlasts other cap material when welding parameters are not carefully controlled. Refractory bi-metal composite produced by a tightly controlled process of pressing and sintering tungsten powder and infiltrating the sintered material with silver. Electrode cap tips are made from class1, class2, Zirconium-Copper, Chrome-zirconium-copper and dispersion strengthen copper. Kindly send us your requirement to quote lowest rates. 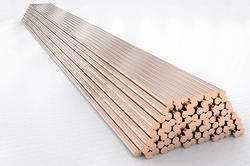 Looking for Resistance Welding ?